Some Guinea Pigs can be prone to bladder problems.If you suspect any urinary tract problem you need to get your Guinea Pig checked out by a small animal vet. 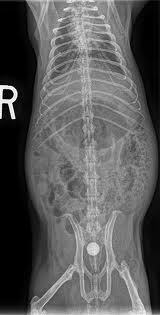 Due to a Guinea pigs metabolism they can be affected by bladder stones and bladder calcium crystal deposits. These can cause a great deal of discomfort,this is treatable and again its important to health check your Guinea Pig on a regular basis to detect changes in bladder habits.Normal urine is clear or milky in colour. Its really important you dont feed a high calcium diet ! Wet behind around genital area.May not be obvious signs of infection,but can be an indication of calcium deposits affecting bladder emptying causing incontinence. Bladder palpation by a competent vet can help flush out calcium sediment. Difficulty in urinating, squeaking with pain when urinating,hunched back may appear to strain.Can come on acutely if a stone has dropped into the urethra.The Guinea Pig may be eating and pooping fine but needs to be checked out. Urine has gritty texture - calcium deposits this can be evident when the urine drys.You may find calcium deposits under a boars foreskin or around a sows urethra which can cause soreness.So check and clean on a regular basis with gentle baby wipes. Please note Guinea Pig urine is naturally a creamy colour and will stain a creamy colour,but excess grit should not be present. 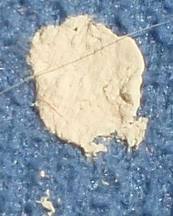 Calcium grit can appear as creamy deposits on fleece and bedding. Feed a low calcium diet which includes dried food and vegetables.You will find calcium diet sheets on our webs link page.This is very important for Guinea Pigs with a family / sibling history of bladder infections. Cut down on the amount of carrot you give,carrot contains oxalic acid which binds free roaming calcium in a guinea pigs system this can then be deposited in the bladder.Just feed carrot occasionally. 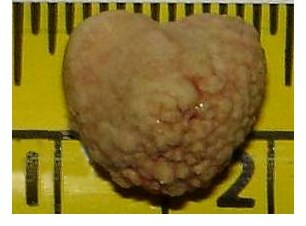 If you suspect a bladder infection / stone,get treatment from your vet as soon as possible!!! Make sure your Guinea Pig has some pain relief during this time such as metacam and check they are drinking plenty of water. Your vet may suggest an xray or ultrasound scan to check for the presence of bladder stones and a urine sample.Best way to get this is to cuddle your piggie in plastic tub whilst eating cucumber or lettuce and wait for the wee.Sringe up in a sterile syringe.Dependant on the results they may palpate the bladder to try and remove excess bladder sludge,a mixture of crystals and debris caused by the bladder emptying excess calcium or they may need to perform surgery to remove a stone. Ask your vet for information on Cystaid - Glucosamine product also used in cats which lines the bladder with a protective coating,you can buy this on line and we have seen very good results with our rescue Guinea Pigs. If surgery is an option,afterwards you will need to house your Guinea Pig indoors with towels and a heat pad - snugglesafe is good brand and microwaveable. Give regular metacam as prescribed. 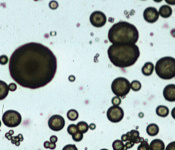 Ensure antibotic courses are completed ! Give your Guinea Pig pro-biotics whilst on antibiotics and for two weeks after.This will help protect Gut motility,which can be affected by anti-biotics.You can also give small doses on live yoghurt just wipe around mouth and piggie will lick off. Occasionally following illness or antibiotictherapy a Guinea Pig needs an injection of metroclopramide to get the gut functioning properly. Your vet can advise you. Give vit c 10mg / kg whilst on antibiotics to help boost immune system.Drops are ok but tablets ensure you know its been given !! My Guinea Pigs take relevant dose in little piece cabbage or grind up and mix with water and syringe feed. It can be a lifelong problem so be prepared to check your Guinea Pig on a regular basis and keep up their diet !